A dream of trying to get away from someone when you are being chased is a fairly common one, and what it means is not as frightening as the reality that you might be running from. Dream interpretation as a psychological field is attributed to Sigmund Freud, the father of psychoanalysis. Freud saw the field of dream interpretation as a way to understand the inner thoughts of the mind. Freud saw dreams an the key to healing people from mental illness. Unfortunately for the mentally ill, dream analysis is not yet a science that can cure the sick. More likely, we dream as a way to process memories, thoughts, emotions and sensory information while we sleep. The images of dreams are often just symbols for things that are going on in our lives. In a dream of being chased by a man, for example, the man is not necessarily a literal male person who you know that you are running from. Instead, the person chasing you represents your problem. 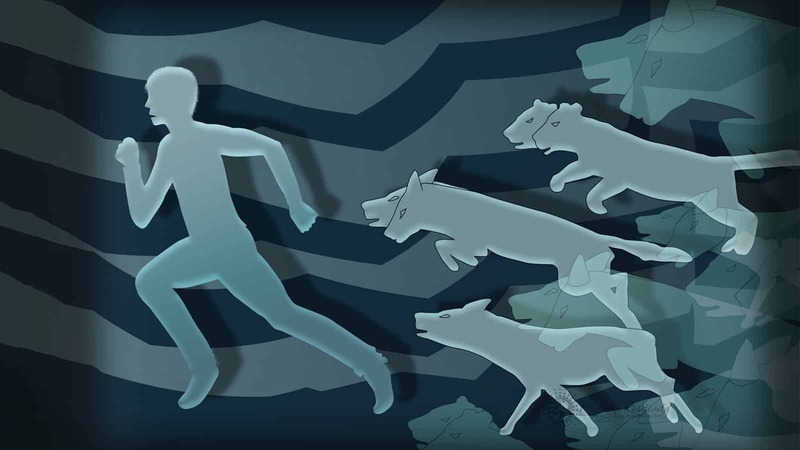 In this article, we will look at some of the common interpretations for dreams about being chased, so that you can better understand the meaning of these visions in the night. What you are being chased by can be different in a dream about being chased. Sometimes, you may not even know what, or who, is chasing you, only that you are running away from it in fear. Fear, in a psychological sense, means that you need to confront something, but you lack the faith in your own abilities to do it. Look at your dreams as a message that is being sent to you from the Universe via your brain to help you with whatever you are dealing with right now. Let’s look at some of the things that you might need to confront and what a dream about being chased might mean to you. Dream interpretation can be complex, and you should remember that nothing like this dream about being chased really happened to you in your past memories; not even in your partially forgotten childhood memories. Memories can be a part of a dream, but a dream is more likely just a series of symbols for what your brain is currently processing while you sleep. Memories get made at night while your brain makes the connections between the person you saw for the second time at the store today and the previous time that you saw that person, what they were wearing, the scent of the frozen foods section, etc. While the brain puts away all of this information, it is also making the connections that you need to solve problems in your life. For example, the brain might remember that Cynthia, who you saw at the store, can do taxes for you and you just got that letter from the IRS, so no wonder you had a dream about being chased. Trying to break away from old habits and old patterns of behavior can be what your dreams about being chased mean. Let go of your old, worn out ways and move on to being happy, accountable and focused on your best future. Holding on to old ways of acting, like envy, jealousy, frustration, and patterns of anxiety are holding you back from becoming a better person. When you can acknowledge that you need to change and you decide to try, you will stop having dreams about being chased. Researchers in the journal Dreaming who studied divorce recovery programs found that a dream-interpretation group therapy session helped the women to increase feelings of self-worth at a time when they needed it. Sometimes your dreams about being chased means that you need to be far away from where you are now and heading in a future direction. That could mean a physical move, or it could just mean making progress toward your goals, whatever they are. Something is literally driving you to go, but you are fearful of making the change. This dream could be a way of seeing the Universe as pushing you to say ‘Yes’ to whatever it is that you were resisting. That’s right, HALF of the people believed what they were told, even though the researchers planted the idea about being bullied.